Mississinawa Valley’s Blake Scholl shoots a 3-pointer against Bradford on Friday night. 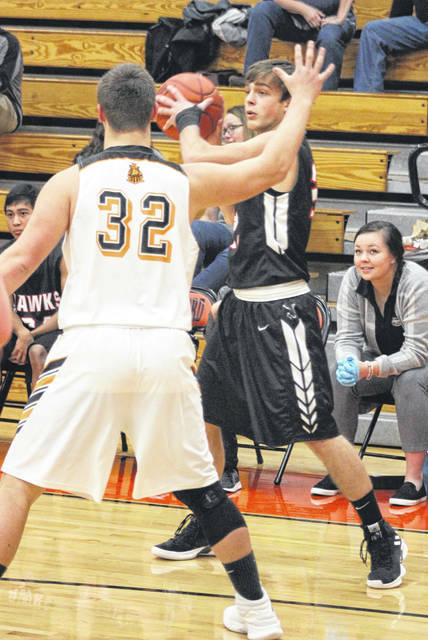 Scholl hit four triples in the game and totaled 21 points in leading the Blackhawks to a 62-21 win over the Railroaders. Bradford’s Connor Jones fights to keep the ball in his possession as several Mississinawa Valley players try to take it away. Jones led BHS with 9 points, but the Blackhawks won the game, 62-21. Mississinawa Valley’s D.J. 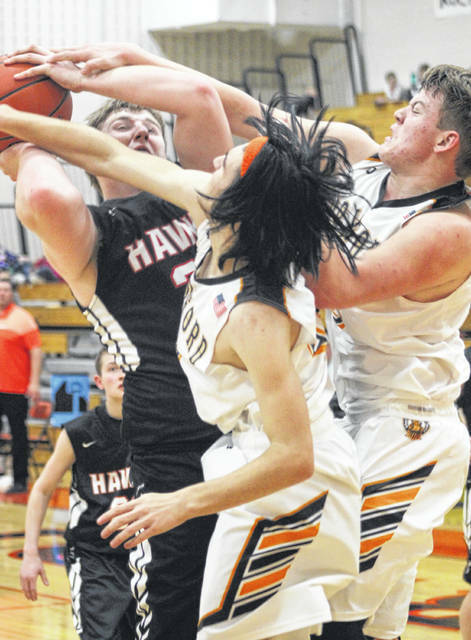 Howell gets hit hard by Bradford’s Connor Jones (center) and Wyatt Spangler (right) as he tries to go up underneath the basket on Friday night. Howell finished with 18 points in helping lead the Blackhawks to a 62-21 win over the Railroaders. 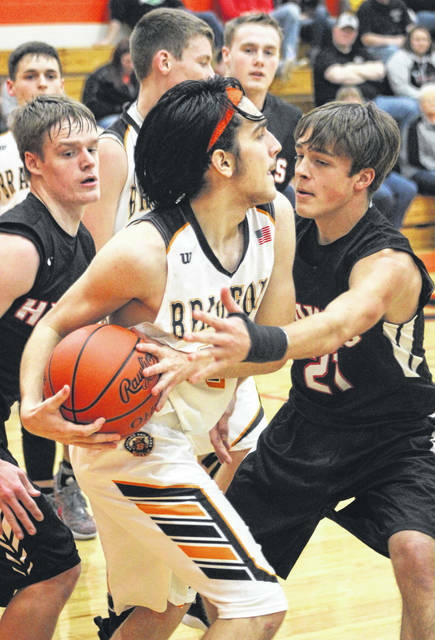 Bradford’s Gaven Trevino chases a loose ball as Mississinawa Valley’s Kyler Guillozet tries to catch up as well during their Cross County Conference battle on Friday night. The Blackhawks won the game, 62-21. Mississinawa Valley’s Justin Miller tries to find an open teammate to get the ball out of the corner against Bradford on Friday night. The Blackhawks won the game, 62-21. The Mississinawa Valley varsity cheerleaders help hold the American flag during a pregame ceremony honoring all veterans at Bradford on Friday night. The Blackhawks defeated the Railroaders, 62-21. 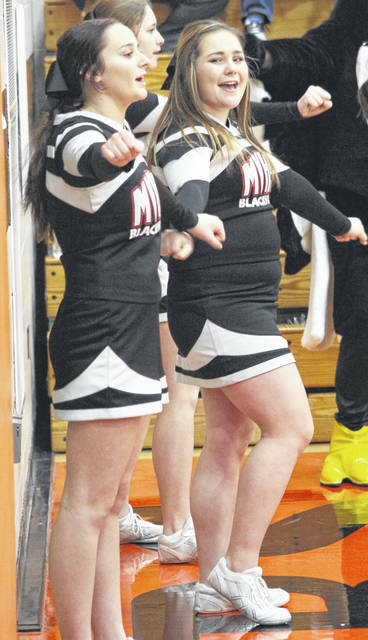 A pair of Mississinawa Valley cheerleaders show their spirit during a Cross County Conference matchup at Bradford on Friday night. The Blackhawks won the game, 62-21. 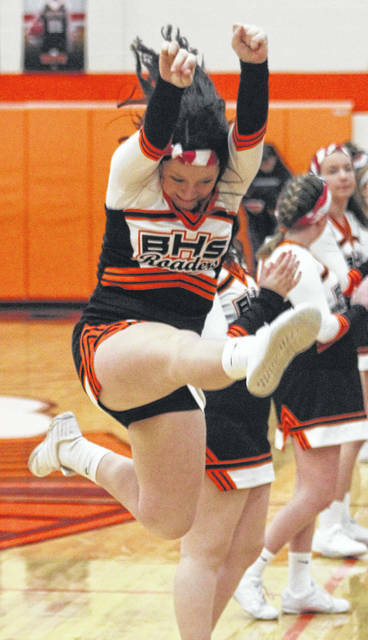 A Bradford varsity cheerleader performs during a break in the action of the Railroaders home game with Mississinawa Valley on Friday night. The Blackhawks won the game, 62-21. Bradford’s Taven Leach tries to score against Mississinawa Valley’s Trent Collins during the first half of their Cross County Conference battle on Friday night. The Blackhawks won the game, 62-21. Mississinawa Valley’s Alex Scholl plays some tight defense on Bradford’s Connor Jones during the first half of their Cross County Conference game on Friday night. The Blackhawks won the game, 62-21. 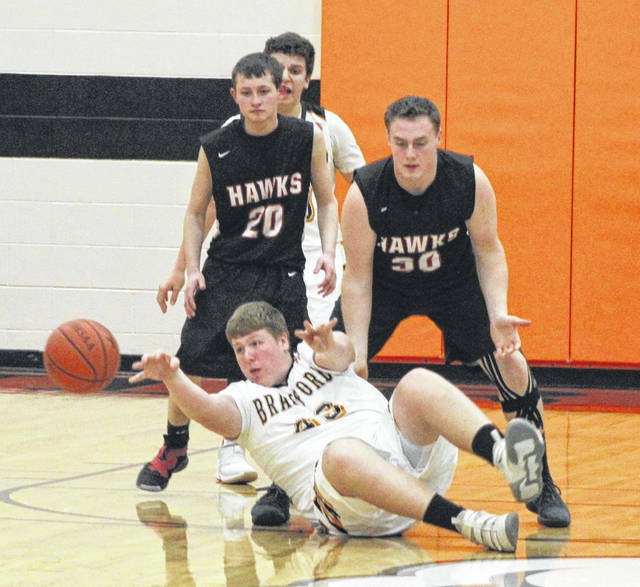 Bradford’s Austin Crickmore throws the ball to a teammate after diving to the floor to get the loose ball against Mississinawa Valley on Friday night. The Blackhawks won the game, 62-21. Mississinawa Valley’s Blake Scholl throws the ball out of the corner toward teammate D.J. Howell during a Cross County Conference contest at Bradford on Friday night. The Blackhawks won the game, 62-21. BRADFORD – Mississinawa Valley’s offense seemed to struggle in the beginning of its Cross County Conference road game at Bradford on Friday night. The Blackhawks missed numerous shots and still held an 11-point lead by the end of the first 8 minutes. 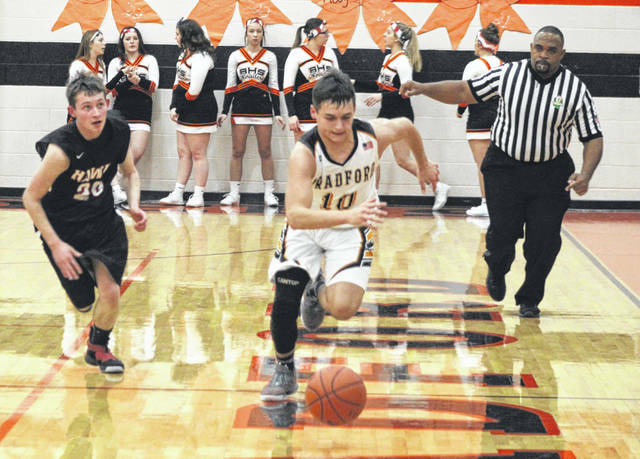 But then a mere 17 seconds into the second quarter, Blake Scholl hit a long 3-pointer – his second of the game – from the corner and the onslaught was on. 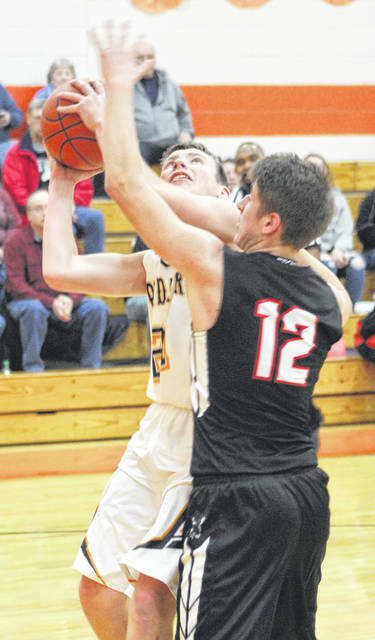 Mississinawa scored 19 points in the second period – its most in any of the four quarters – and defeated the host Railroaders going away, 62-21. Scholl, who is averaging 11.0 points per game, had four triples in the game with all four of them in the bank by the 3:20 mark of the second quarter. When he sank the last of the four triples, the Blackhawks led 24-6. Scholl led all players with 21 points. “It felt good hitting that three to start the second quarter,” Scholl said. “I knew after that something was going to click for us. That’s why I kept taking shots and we were able to come out with a win. Mississinawa Valley coach Tim Barga liked what he saw from Scholl. Scholl said he hasn’t started out the best this season, but feels he is starting to be more consistent offensively. Scholl wasn’t the only ‘Hawk to reach double figure. D.J. 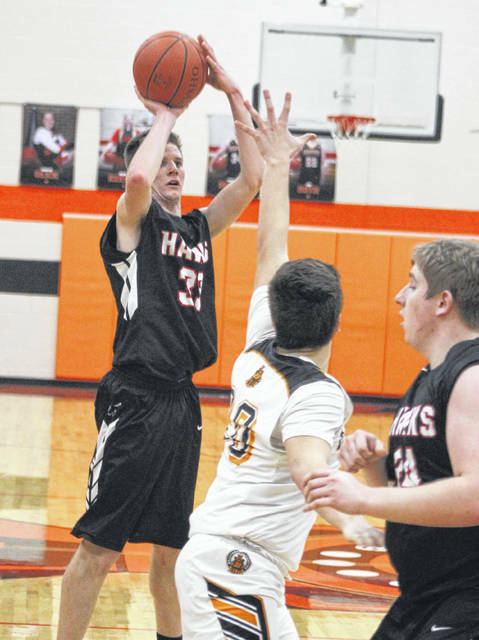 Howell, who is averaging 16.3 points per game, totaled 18 against Bradford. He had six buckets and hit six free throws for his scoring total. 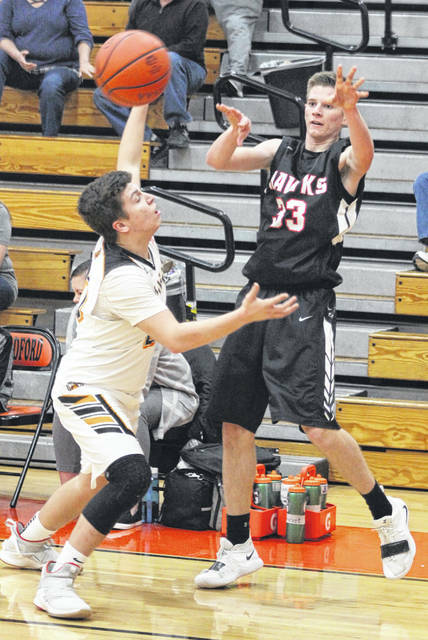 Senior Justin Miller also made his return to the floor for Mississinawa with a pair of 3-pointers and 8 total points all in the fourth quarter. “Justin Miller is a senior, but he broke his wrist and this is his first game back,” Barga said. “He hit two 3s there at the end so that was exciting for him. We had Josh (Fett) and Max (Dirmeyer) on the bench with ankle problems. They both could have played tonight, but we knew we weren’t playing tomorrow already so we wanted to give them that much more rest. We need them for the rest of the year. The Railroaders were led by Connor Jones with 9 points. Both teams return to action on Jan. 25. 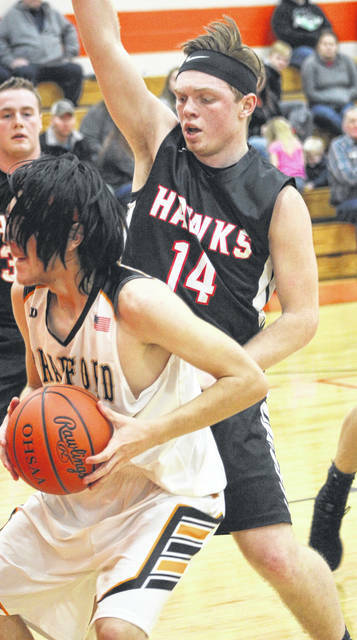 Mississinawa Valley will host Arcanum, while Bradford travels to Franklin-Monroe. Mississinawa Valley – Trent Collins 1 1 3, Alex Scholl 1 3 5, Kyler Guillozet 1 1 3, Mason Hiestand 1 0 2, Xavier Manning 1 0 2, Blake Scholl 7 3 21, D.J. Howell 6 6 18. Totals: 21 14 62. Bradford – Gaven Trevino 1 0 2, Gage Wills 1 0 3, Wyatt Spangler 1 2 4, Connor Jones 3 3 9, Austin Crickmore 0 3 3. Totals: 6 8 21. 3-pointers – Mississinawa Valley 6 (B. Scholl 4, Miller 2), Bradford 1 (Wills 1). Records: Mississinawa Valley (5-7, 4-3 CCC), Bradford (0-13, 0-8 CCC). JV score: Mississinawa Valley 54, Bradford 21.